It’s our #1 selling appetizer. Served with giant blocks of fresh mozzarella cheese deep fried in homemade breading. Waffle fries smothered in monterey jack, cheddar, bacon, sour cream and jalapenos. Red-hot jalapenos stuffed with cream cheese and served with strawberry chutney. Tortilla chips topped with chicken, queso, honey BBQ sauce, red onions and cilantro. Topped with bacon, blue cheese, chopped tomatoes, and green onions. 6 buffalo bites, 4 fried pickles, 4 holy macaroni and 2 fried cheese. Fresh, hand-breaded, bite-sized version of our boneless wings, tossed in your favorite wing sauce and served with fries. Served with macaroni and cheese. A garden salad with chopped chicken tenders tossed in your favorite wing sauce. A salad full of crunch featuring crisp lettuce, grilled chicken, diced tomato, black beans, corn, honey BBQ sauce and topped with tortilla strips and onion straws. Served romaine, black beans, corn, tortilla strips, onion straws, and classic caesar dressing. Served grilled chicken, avocado, blue cheese, bacon, egg, tortilla strips, tomatoes and cabbage all neatly stacked on top of crisp lettuce. Grilled chicken, iceberg, romaine, diced tomatoes, carrots, cabbage, egg and garlic croutons. Bacon and cheese. 12 oz. of hand-breaded chicken tenders tossed. Half pound of our fresh chicken tenders cooked on the grill and served with your choice of side. A hamburger topped with bacon, cheese, grilled onions, jalapenos and Pluckers sauce. Burger tossed in honey BBQ sauce and covered with cheese and grilled onions. A classic with a Fresh hamburger patty with sliced American cheese and grilled onions served on Texas toast. 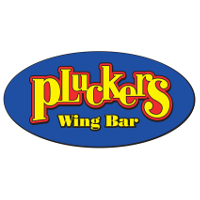 Boring compared to everything else, but wait until you taste the pluckers Sauce on it! We dare you to finish it! A double meat burger topped with queso, pluckers Sauce, grilled onions, bacon, and jalapenos served with a side of waffles n’ cheese and a 34 oz. A hand-breaded and fried chicken breast tossed in your favorite wing sauce and served with your choice of ranch or blue cheese. Man, it’s a fried chicken breast with queso, guacamole and tortilla strips, man. Smothered with grilled onions and queso. Thinly sliced chicken smothered in grilled onions and queso. A grilled chicken breast tossed in buffalo medium and topped with bacon and cheese. Sauteed mushrooms, bell peppers, and onions topped with melted cheddar cheese, shredded lettuce, diced tomatoes, and sliced avocado served on our hoagie roll. Like the hick from French Lick, our chicken is all white meat tossed in your favorite Wing Sauce. Texas toast smothered in butter, melted American cheese. 6 strips of bacon, lettuce, mayo and a slice of fresh tomato. A chicken breast topped with bacon, cheese, grilled onions, jalapenos, and pluckers Sauce. Fresh cooked chips served with homemade blue cheese dressing. Waffle fries tossed in cinnamon and sugar.